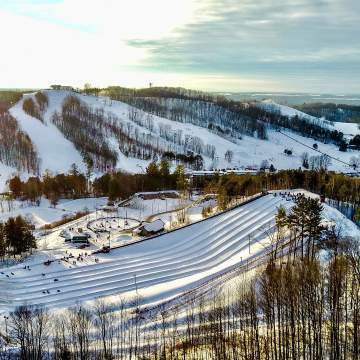 Over the past couple of seasons, the Outlaw Terrain Park at Horseshoe has worked hard at positioning itself to be the best progression terrain park in Ontario. A real focus has been put on making sure that the park caters to all skill levels and abilities. The park set up and features ensure that there is something for everyone from young children and beginners, to intermediate riders looking to advance and even the more seasoned athletes who just want to get out there and have fun! A lot of thought, planning and trial and error goes into creating an environment that everyone feels comfortable in. Matt Konings, Operations and Terrain Park Manager, doesn’t want anyone to be intimidated by the thought of entering a terrain park, especially when it comes to the Outlaw Terrain Park at Horseshoe, “It’s important to us that the park is fun, safe and inviting, which is why we have a wide variety of features so that anyone coming into the park has the opportunity to try something that is best suited to their needs and abilities.” Matt brings a lot of knowledge to the table, with over 20 years of experience snowboarding and 17 years of experience working in different terrain parks. He loves having the freedom to come up with new set ups and spends many nights out on the hill experimenting with his team. It’s always exciting for the terrain park crew when a new set of features gets added to the fleet. 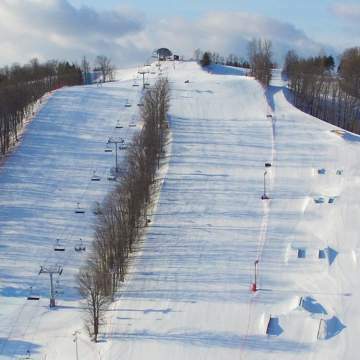 Four new Coastal Jibs features were added to the park last week: a 24′ double whammy, 20′ wave, 24′ rooftop and 28′ down-flat-down. Not familiar with these terms? That’s ok! Just take a look at the image to the right for a visual. The double whammy is unique in that it’s an all-in-one feature with rails on both sides of the box. What’s even cooler is the fact that one of the rails is removable! 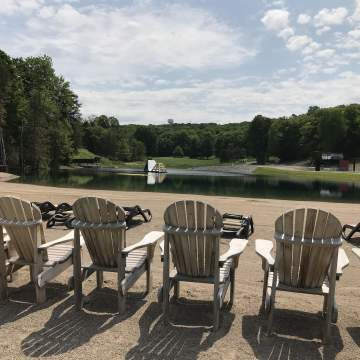 The new additions from Coastal Jibs not only add to the diversity and creativity of the park, they also allow for more progression, which is very important to the overall vision of the Outlaw Terrain Park. Typically beginners start out on shorter, wider boxes before making the move to boxes that are longer and more narrow. Once they have mastered the boxes, riders can move on to more advanced features such as rails. 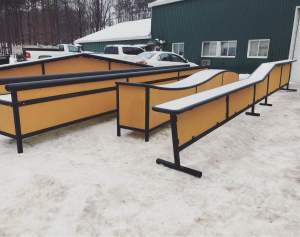 Just like with boxes, the Outlaw Terrain Park has several different types of rails that allow riders to advance as they improve their skills. 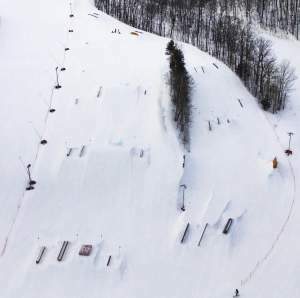 In addition to the new features from Coastal Jibs, the Outlaw Terrain Park acquired three unique features from Vans Canada, after hosting the Vans Hi-Standard Series for the first time last month. 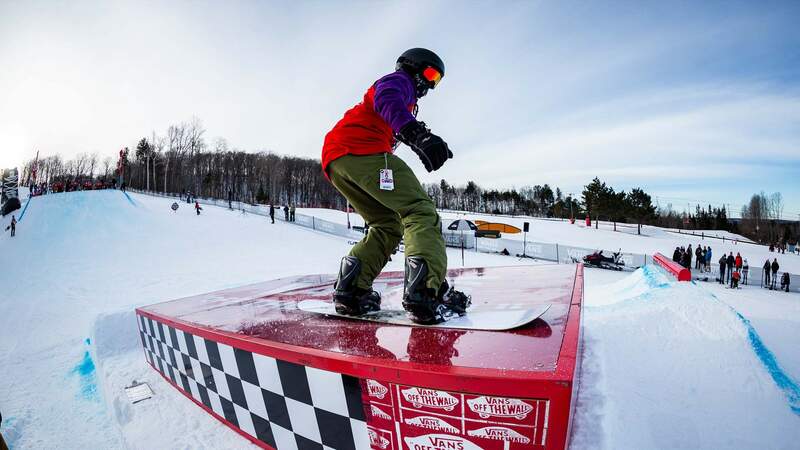 The international competition invites snowboarders from all over the world to show off their style and creativity in a fun jam format. No pressure to do big tricks and no cost! Registration was free and included a lift ticket and lunch. 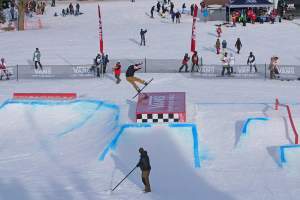 Vans generously donated the three features that were used during the competition–a dance floor, mailbox and rail. The 8ft x 12ft dance floor is a unique feature and is something that you don’t see at many resorts.